I would like to share some hard found knowledge in the construction of vertical gain arrays in my backyard and also pass along some means and methods, that might serve others in their own experiments. Modified 4 square using two types of phasing with 3.2db gain in chosen directions. 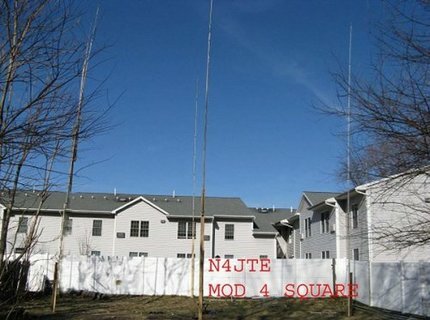 GOALS; To find the cheapest way to obtain 4 directions on the 40 meter band with decent gain and useable front to back. LIMITATIONS; Small backyard with terrible ground conditions and no money for the $500 Comtek phasing controller. Judging by past submissions on Eham, the paint illustration above might not be as legible as it appears on my computer so the following discussion will give plenty of details. The adventure begins; The simplest proven method for me to get a durable mounting setup for all my vertical experiments is to start by using 4x4 PT. poles. I posthole them about 2ft deep thru the rocks. I do not use concrete because in my case it would be overkill. I plumb the exposed 6ft of the 4x4 while backfilling the dirt and rocks removed and pounding the crap out of them with a 5lb sledge, better known as tamping. For this experiment I had previously set 4 posts at the traditional 4 square dimensions but when my daughter surprised me with her marriage in January at a location in Key West Fl. The cost of a true 4 square became temporally out of reach! So I pulled out the posts and reset at 33ft. 7 ins apart in the NE/SW and NW/SE directions to achieve the needed free space spacing for ¼ WL at 7.185. The true 4 square develops close to a 3/8wl, aprox 48ft. spacing across the aiming corners. 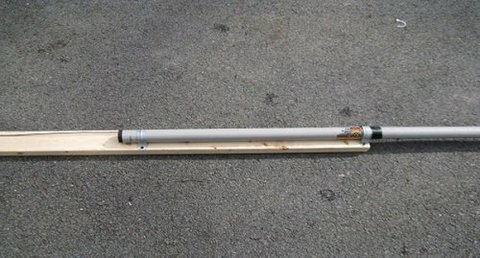 Fiberglass flagpoles are the vertical builder’s best friend, I purchased 4 of these at around $50 each and got a nice US flag with each one! www.polesandholders.com. They nest at 4ft and extend to 24 ft with three pins at the lower sections. Also included is neoprene slip over rings for guying, nice touch but not needed in this application. I have used the spider poles and various MFJ poles and I have to recommend these poles as more stable and durable. To make up some more height, I added one piece of 3/8 by 8ft. fiberglass to each pole that inserted very nicely into top section of the flagpole. 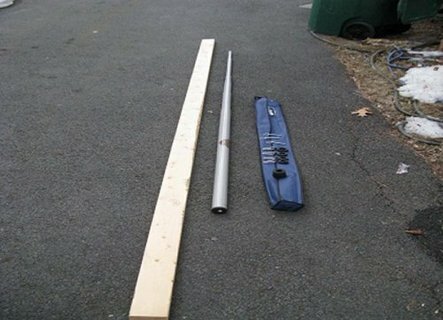 The total fiberglass pole length was now about 30ft with adequate nesting for strength. The extra 3 ft. of wire would end up being tied off to the 12ft 2x4. I attached the pole to a 12ft. 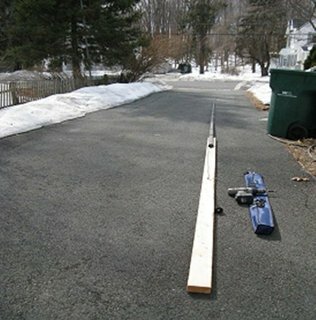 2x4 using 33ft. of #12 insulated wire taped off at all joints on the pole. This setup got me a very lightweight 38 ft high pole easily screwed to the waiting 4x4’s. It was very easy for this old fart to raise these up by myself, for an easier way, one could screw on a galvanized cheap 3in. door hinge to the bottom at the 4x4 for simple tilt over. 1; SPACING; With any 2 element, endfire vertical array, the most useful spacing ends up being at the ¼ wl free space dimension for maximum gain and front to back available. Increasing the spacing slightly will add a little better gain but the extra developed lobe is not what I was after. If broadside is your preference than a 180 degree spacing is the best point to start. The 3/8wl spacing on the conventional 4 square will achieve about 5.2db, hence the hefty cost for the hybrid converter. At my final dimensions I consistently get + 20db of front to back, the gain competes equally with an EDZ at 65ft in the same directions. 2; PHASING; My final project used two different phase systems. I made the NE/SW pair at a 90 degree reversible cardoid pattern. Using the Christman/ ON4UN calculations the feedlines are in actuality cut for 84 degrees with a leadline of 71 degrees for direction change, see www.n4jte.blogspot.com for expanded detail on construction. Also VA7ST, Bud, has a Christman calculator, along with a lot of great wire beam info on his website. I made the NW/SE pair using a force-fed 180 degree system by tee connecting between a ¼ wl and a ¾ WL with the feedline achieving the same 3db gain but bidirectional simultaneous. I have no need for front to back or direction changing in those directions from my location, your mileage may vary. 3; RAISED RADIALS; I spent many hours trying out various amounts of raised radials while only one element was up and running. 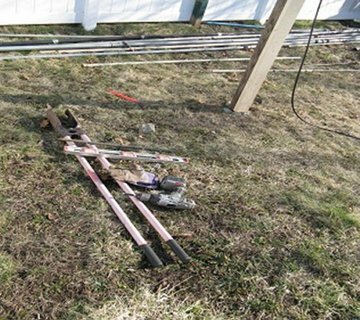 The vertical paradigm is the use of a full size 1/4wl vertical element with 100 buried radials of equal to, or longer, than the vertical dimension. This arrangement theoretically has the most efficiency, yielding a Z of 38 ohms measured at feedpoint. Take some time and check out N6LF’s extensive research, I did! 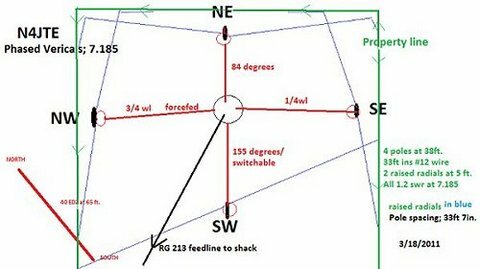 A; (1) radial, fat, using 2, #12 insulated radials, at 6 ft. above ground measured 60 ohms Z. ON4UN has had very good results with this layout and mentioned a slight direction reinforcement in the direction of the radial on his 80 meter antenna. I tried a few directions with the single fat radial, but did not keep going enough to verify his findings on my backyard on 40. B ; ( 2) radials about 180 degree separation, measured 48 ohms at 6 ft. high, my final choice for all four elements. C; I tried (6) raised radials and the best Z I measured was 42 ohms, in my case not worth the effort with 4 elements, as 24 of them would be overlapping all over the place skewing pattern and phasing, not too mention strangling some low flying birds. D; A substantial ground screen of previously buried radials is helping diminish some of my ground losses but a nice layout of dense surface wire would help my system retrieve some of the 20% power melting the worms. Take note that the near field ground condition is the only area that we can try to maximize, the far field conditions helping the angle of takeoff reinforcing on our signal is usually beyond our control. Always hit and miss with verticals. A nice Caribbean island would be ideal! 4; BALUN OR NOT; : Easy answer, NOT. A typical 1 to 1 balun will totally screw up the quadrature phaselines even if connected during phaseline cutting to length. It took me way too many hours to learn this. Use an appropriate number of ferrite cores or a tight 8 turn coil of the feedlines at the vertical connections. When doing the 180 degree forcefeed the commercial 1 to 1 baluns were used here. 5; RESONANCE OR NOT; As stated, a well built vertical with a maximum ground radial system will show 38 ohms, not a perfect feed for 50 or 75 ohms with resultant natural swr, but perfect ! Getting a 1 to 1 swr on any vertical direct feed is NOT a good thing ! When building an array of this type the best method is to put them all up and check one at a time with other 3 shorted out, no feedlines connected. Check for lowest SWR and trim radial lengths for best swr at your frequency. Leave vertical wire unchanged. 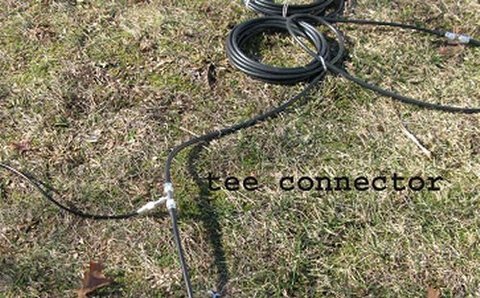 The ONLY naturally resonant/ easy direct coax match antenna, is a true, center fed dipole in the air a ¼ wl or higher. 6; ANALYZERS; If your going to get serious with wire lower band antenna experiments you will need to invest in an analyzer. MFJ 259b is a good, but, heavy battery eating start, my choice these days, is the Autek VA1 due to small size and expanded capabilities. However; the customer service at Autek reminds me of the “soup nazi” episode on Sienfeld years ago. That guy is a piece of work! To summarize, after all the testing, I settled on the reversible NE/SW reversible design to take advantage of the 20 db of front to back. The NW/SE pair was phased with 180 degrees as the front to back is not a concern here in NY. The final array is fed with rg213 to a remote antenna switch for picking either pair. The 12 volt needed to the relay on the reversible pair was accomplished by resurrecting an old 100 ft. extension cord retired from previous construction jobs. At the shack the relay is kicked in for the NE direction by a recycled single pole light switch on the negative side of the cord and screwed to shack desk. I would not have submitted this article and waste your time reading if this design did not work. Always a can of worms but let me explain why I recommend this design. I spent a couple of months listening, switching directions and transmitting at all times of the day. The center freq. of testing at 7.185 on the OMISS net gave me a reservoir of over 50 stations a night, 7 nights a week to make my observations. That, and the contests every weekend gave me a real world comparison to check things out. Sorry no test range here. After all kinds of propagation/weather at my lousy 300 ft above sea level location surrounded by 5000 ft mountains and the ability to switch directions and compare to a 40 meter EDZ at 65 ft, I submit my experiences are worth noting. The NE/SW pair is a light switch for calling or eliminating European DX which overwhelms the EDZ. I break any pileup on first or second call during contests, I work Alaska at will when on, yada yada yada. My point is, it works well and FUN to play with. This article was written as more of a fact finding mission that I wanted to share as opposed to the next “ Big Idea”. 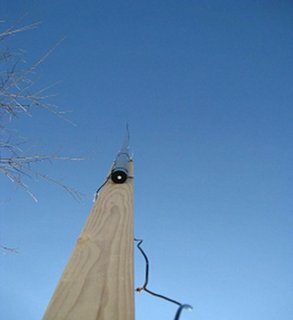 My hope is that others will find the excitement in building your own wire antennas that I do, and the incredible wealth of knowledge out there these days from earlier and current experimenters that created this great hobby, and continue to help us expand our horizons with real world testing and documentation. 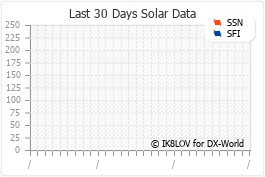 I am never more than a short reach away from the ARRL antenna books ,ON4UN Lowband DXing, N6LF’s vertical papers, and the W8JI and Cebik websites. They, and about 10 other resources, might provide that little nugget of information you might have missed on the first reading that will send you out to your backyard when it’s 10 degrees and snowing. WHY? Because you are addicted my friend, building your own antennas is a trip!